note: all of the links on this page open in a single, separate, window. This class was offered through the Agricultural Extension Office, advertised in the local paper. Reading about it several years ago, I begged the instructor's phone number. I knew I could not attend...at least for a couple of years, and was desperate to find another coiler in my area. Someone to bounce ideas off, to ask questions, just to know. 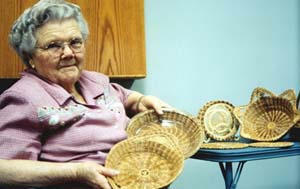 This is the only other person in longleaf-rich eastern North Carolina whom I had heard was coiling. 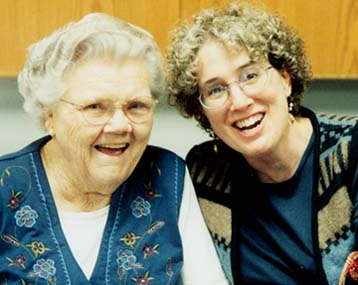 Calling Gladys was the beginning of something wonderful for me. At the time, I was not online. I had learned as best I could from books, and by trial and error. That was 1998. For the past three years, Gladys and I have corresponded by snail mail, sending photos back and forth. It has been wonderful to have a mentor, even a long-distance one. That first tentative contact is what made me know, once I came online, there must be a place for coilers to gather and share information. But there wasn't one, so I made my own. That is why calling Gladys, was, really, the origin of The Pine Needle Group. Two of us from The Pine Needle Group attended the two-day class: myself, and Lynn Hoyt, whose thoughts on the class appear below. Learning that Gladys had suffered a heart attack this winter and was only recently released from the hospital, I wondered if teaching a class this soon was a good idea. The class was listed for 2 eight hour days, which sounded pretty long. I needn't have worried. Gladys was up to it, even if we participants were not. She was on her feet for almost the entire first day, helping each participant through the most difficult part of the basket - the start. Gladys learned to coil about 40 years ago, when she was an Agricultural Extension Agent. She came home, taught her mother to coil, and went back to work. 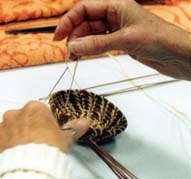 In the years that followed, Gladys continued her career, and her mother became known throughout the area for coiling lovely pine needle baskets. 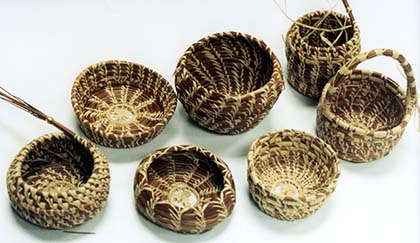 Gladys purchased one of each style of her mother's baskets. 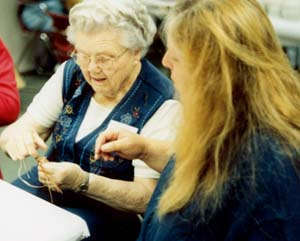 It was not until about 20 years ago, when Gladys retired, that she was able to return to the art of teneriffe on her own. 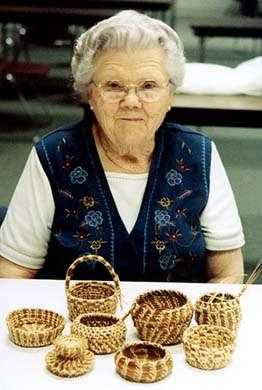 Most of the baskets she has made have been sold. Her proudest creation of those still in her possession is a pie plate carrier, with its own glass plate...it fits perfectly...and what a lovely thing to see, peeking through the cut pie (though I cannot see how she can stand to actually use it! Looks more like a museum piece to me.) 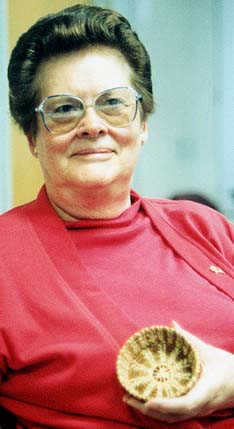 She is holding it in her left hand, in the photo above. 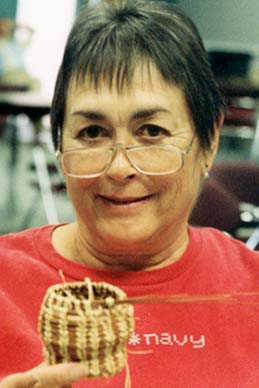 Gladys prefers the "Jeannie McFarland style" of basketmaking, and has studied Jeannie's books, as well as that of Judy Mallow . She purchases most of her supplies (and kits for the class) from those two sources, even though she has her own forest from which to collect. It is just too difficult and time-consuming, at 82 years of age, to bend over and pick up pine needles. Gladys' husband planted over 1,000 long leaf pine trees, years ago, intending to harvest them for timber when the time came. Having lost her husband before the trees were used for timber, Gladys used them for years for their needles instead. She still offers free harvesting to her students. Each person was provided with a commercially purchased "pin dish kit" - a bundle of pine needles, a ring, small brass fitting from the hardware store for a gauge, some raffia and a sewing needle. Gladys, in her wisdom, also provided a small plastic hinged box for storage of our tools. No instructions were provided in the kit, and Gladys gave us her own xeroxed instructions. I was shocked to find she provided the class with instructions and box for free. The materials fee for the class was less than $5 (the actual cost of the kit, so she lost out on shipping), and the class itself cost $10. Buttonholing the ring was addressed as a group, and then each person proceeded following the written instructions at our own pace. There were very few interruptions for general class address. This style of teaching is difficult on the leader - having to move from one pupil to another, covering the same information over and over. But Gladys handles it well. I don't know how she was able to drive home at the end of the day. Gladys has developed several of her own techniques throughout the years, which we adopted eagerly. 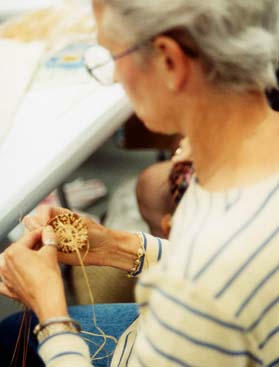 One that I especially appreciated was the trick of staggering your begining needles, and then, after the stitch pattern is established, binding the needle ends in reverse (as shown at left). 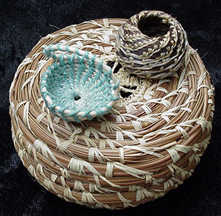 One participant had returned from last year's class, and was making a lid for her previous year's basket. 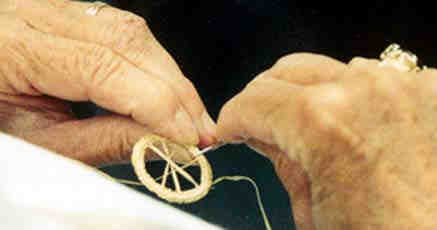 The end of the first day, most people had their start ring done, a few people had the bottom of the basket finished. Many people did not show up the second day at all. 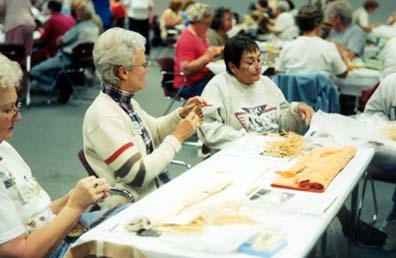 Most of those who showed up did finish their basket (see the group's baskets with Gladys, at right), and some started a second (or a lid). Everyone seemed to have trouble with the raffia. Seems like this is a universal complaint, we hear it all the time on the mailing list. 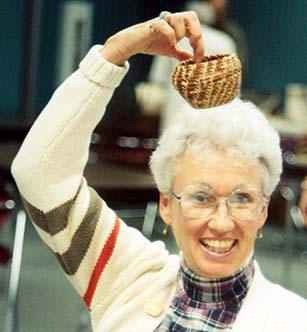 I brought what was left of a basketry grade raffia bundle for students to try, which was greeted with slightly more enthusiasm. Gladys, having only a few suppliers to purchase from, had never used it, and was pleased to find longer, stronger raffia. 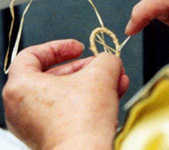 If you are in the area, and have a chance to attend Glady's 2-day "Pine Needle Pin Dish" class held in Plymouth, NC, I recommend it highly. For information on classes, write to: Faytie Johnston, Northeastern North Carolina Craft Workshop, 621 Alton St., Elizabeth City, NC 27909 . 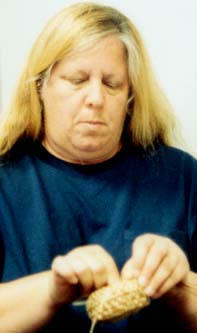 Her phone number is (252) 335-4680. 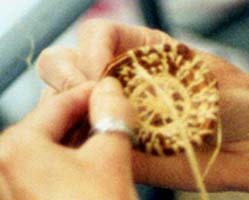 Other classes offered in 2001 workshop included: Beaded Bags, Zipper Jewelry, Pottery, Armenian Needle Lace, Seagrass Stool, Decorated Eggshells, Papermaking, Wood Carving, Copper Enameling, Dulcimer, Rubber Stamping, Redwork Embroidery, Gourd Art, and Oil Painting. Disclaimer: Understand that these comments come from someone who doesn't always learn easily, but usually improves vastly the second time around. 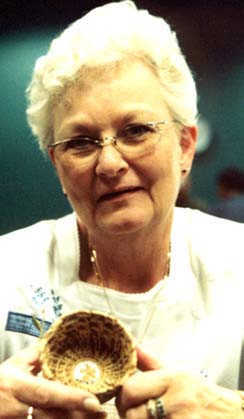 Our teacher, Gladys, was a very sweet lady with a well-established way of doing things. This was my first attempt at teneriffe, and I had some trouble following her instructions. From the very start I was playing catch-up. Actually, the biggest obstacle for me was the binder from hell she handed out-- a thin raffia that constantly kept breaking. Guess I'm heavy handed and all thumbs, so give me imitation sinew any day. 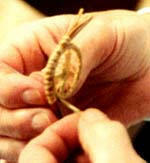 Heck, with sinew I could have coiled it faster using my toes! First I'm working the wrong way, loops weren't small and even enough, not coiling tight enough.... it was mighty slow going. Really it was kind of funny, as I continually amazed myself (and I'm sure everyone else) with how inept I was. Coiling next to me was Pamela, who was whizzing through baskets like they were shots of tequilla. Gladys saw that I was struggling and was pretty patient, but I still had the feeling that perfection was stressed a bit too much. After a few more bouts of instruction things got easier, not that my stitching was what it should have been. The teacher good-naturedly gave up, and I just did my own thing with the basket. Basically, I laughed my way through this class, when I wasn't grinding my teeth. At the end, I was the only one who's stitches weren't straight up and down. It was embarrassing until some of the class wanted to know from the teacher how to achieve that cool swirling pattern. Ha! The grass really is greener on the other side! Postscript: My basket is so ugly that I keep it upside down and use it as a stand for two cute minis. links checked by B. West 1/25/04, thanks!